Water pumps are essential to the function of your recreational vehicle, especially if you are camping far away from a water source. Water pumps draw water up from your water tanks underneath your RV and pump the water throughout the RV; to your sinks, toilets, and showers. Water pumps are typically powered by 12-volt batteries and do not need electricity to function. Choosing the right water pump for you RV sounds like a daunting task, but with the right information and product suggestions, you will find recreational vehicle water pumps are easier to understand and install that you might have thought. Quick answer: What are the best RV pumps for 2019? Does the water pump come with a manual? How many gallons of water should your RV produce to function comfortably? There are three main types of water pumps that are helpful to know about when shopping for your RV. Shurflo, Flojet, and Bayite are the most commonly used and easy to understand water pumps. They are all very similar in the way they are set up and function. There are some differences you need to be aware of to buy the right pump for your RV, though. The main differences between these three types of water pumps lie in their Gallons Per Minute (GPM), Pounds Per Square Inch (water pressure or PSI), and Amperage (strength of electric current or AMP) measurements. Each recreational vehicle is different, so make sure to check what requirements your RV requires for water pumps. Otherwise, you risk damaging your pipes with too much pressure, electricity usage, and low water flows to all your outlets. It would be a shame to have your water pump arrive at your house, go to install it, and have there be no instructions. Not only do owner manuals help with installing your equipment, but they also help educate the owners on care and maintenance of the water pump. Check with your manufacturer for information on the correct water usage your RV can handle. This is important for both your water consumption and understanding of which pump to buy. When shopping for your water pump, the answer will fall under the Gallons Per Minute product description category. Check your old water pump to make sure your new one will fit. Check to make sure you are buying a water pump that is the same size and weight as your old one. Also, make sure it produces the same PSI and Amperage recommended for your specific RV. You don’t want to ruin your plumbing! Lastly, you want to check and make sure that the company you are buying your water pump from includes a warranty. This is a good precaution in case your pump becomes damaged for any reason. Here are some water pump suggestions that have the best ratings and the best owners satisfaction. These pumps do vary in price, so we arranged them from least expensive to most expensive for the sake of the buyer. 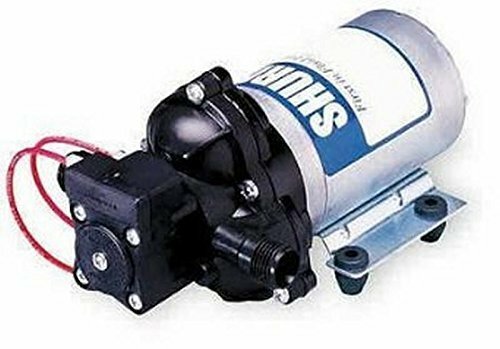 The first of the two Shurflow water pumps represented here is a great choice for your RV. 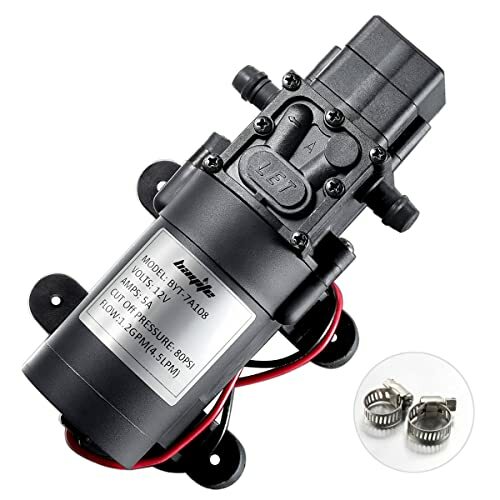 This water pump includes a self-priming feature, a four-chambered diaphragm with adjustable pressure switch and by-pass (to avoid ruining your unit and’or plumbing), as well as a built-in check valve to eliminate back-flow into your system. You will always experience a quiet operation with this water pump, as well as the ability to dry-run the unit. Never worry about the weather destroying your water pump, for the Shurflow 3.0 is climate protected for our convenience. With a vertical suction lift of 6 feet, a PSI of 55, and pumps 3 Gallons Per Minute, this water pump falls into the mid-range of powerful water pumps. The Bayite Fresh Water Pump features smooth and even water flow, even at its maximum psi, and runs quietly and discreetly all day long. Electrocoating protect the switches and wires from corrosion, and the body of the pump is also water and dust resistant, so you will never have to worry about cleaning this pump to avoid damage. Other features include a self-priming function, a vertical suctions lift of 6.6 feet, PSI measurements at 80-85 for its default and 100 at its maximum pressure measurement. This pump is great for heavy duty use, as it pumps a large quantity of 4.5 gallons per minute. The water pump kit also includes two tube clamps as well as 3/8 inch Inlet/Outlet hose ports for your convenience. 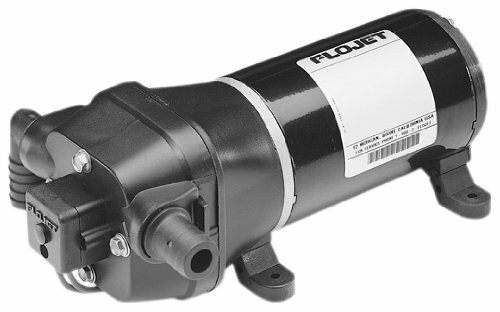 The Flojet Quad II water pump is one of the less powerful pumps on this list, but nonetheless a quality water pump. You may want to try this pump if you have a smaller RV or camper, and also if you don’t plan on using its amenities very frequently. This pump includes a self-priming feature, a four-pistol configuration made for high water flow, and a switch for intermittent running (so you can control how frequently the pump runs). One neat feature about the Flojet is that you can install up to five water outlets on one single unit. The vertical suction is a little over 7.5 feet. Its PSI runs at 35, yet it still is able to pump 3.3 gallons of water per minute. Last but not least is another Shurflo Fresh Water Pump, featuring a few differences between the other Shurflow mentioned above. This Shurflo is a tad bit weaker in power compared to the Shurflow 3.0 but is wonderful for use in smaller campers and RVs that are not lived in for long periods of time. 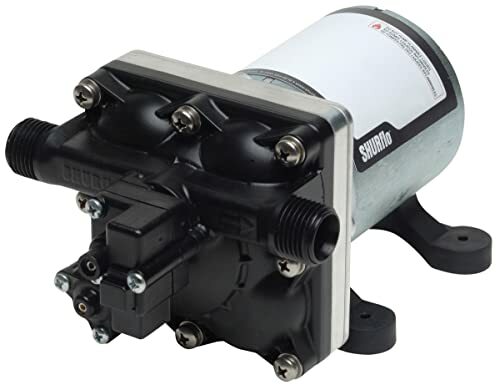 Instead of a four-chamber Diaphragm Pump, this pump features a 3-chamber diaphragm pump. It still includes a built-in check valve to prevent back-flow into the unit and is throughout climate and thermally protected. The vertical suction lift is 6 feet, includes a 45 PSI, and pumps 3.5 gallons of water per minute. Whether you are a first-time water pump buyer, or you are a well-seasoned RV owner who is seeking more information on pumps, use this article as your guide to finding the best quality water pump for your RV. Make sure to ask questions (see What To Look For In A Water Pump) and check with your manufacturer to get the correct specifications for your RV beforehand. Happy water pump shopping!